The Sierra Madre Tattler! : Pasadena City Hall Insider: "Where two or three gather Under the Dome, a conspiracy is suspected." Pasadena City Hall Insider: "Where two or three gather Under the Dome, a conspiracy is suspected." Pasadena City Hall employees know who's absent and why they are missing. Rumor has it that among the people placed on administrative leave are Finance Department personnel - George, Hasmick, Flo, and Patty. If not yet, then perhaps soon? You know how rumors go. Why the clerks? Least likely to be missed when they're replaced. All four technically overstepped their authority in processing payments and blatantly disregarded accounting procedures put in place to make sure abuses of the system didn't take place - or did they? Confirmed Finance Department employee Larry Hammond, Purchasing Administrator, and Public Works-Engineering manager, Bonnie Hopkins, Principal Engineer, are among the disappeared. Before the Special Check Request was presented to them by their boss for processing, it would have first been signed by Wooten himself, and Siobhan Foster, Public Works Director, and walked to Larry Hammond, Purchasing Manager - who acted as gatekeeper for all Special Check Requests. Larry would personally hand the document(s) to Andy Green, Finance Director, for approval, and only at that point would it be returned to the clerks for inclusion into the special check request run. At what point would an accounting clerk rise up from their desk and say, "Wait a minute, Ms. Foster, this is an illegal transaction," "Wait a minute, Mr. Green, your Accounting Prcedures say I must have a payment authority." It's just a lot easier to place the blame on the clerks. It's the "we've always done it this way" mindset that created the climate for the financial abuse to occur. Why would Wooten think after the first sham invoice was presented and paid that he would be challenged? Suddenly, it became, "We've always done it this way." 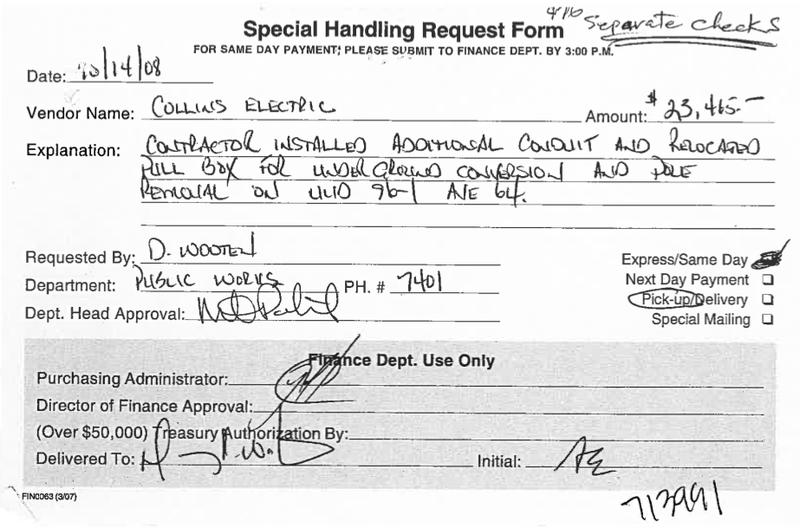 Wooten wasn't the only person misusing the Special Check Request system; perhaps he wasn't even the only embezzler - just the one that got caught. Steve Mermell, Assistant City Manager, was for years Deputy Finance Director, under Jay Goldstone. No one in the City knows more about the accounting system than Steve. No one's asking Steve on the record how this could have happened. Steve put in place procedures and protocols so that it couldn't happen. Had those very same procedures and protocols been followed by the four people placed on administrative leave, had they been enforced by Larry Hammond, Siobhan Foster, and Andy Green, Danny Wooten would not be in a jail cell and his cohorts would not need to be free on bail. Use our easy withdrawal form for quick service! Siobhan Foster had within her department a Financial Services Group. One of the group's duties is to track fund balances. Remember it is the Underground Utilities Fund that is in the news. The funds are reconciled monthly. How is it that invoices were presented and paid without purchase orders or contracts, reimbursements issued to businesses and individuals whose addresses did not reflect work currently being performed, and for work not scheduled to begin until future budget years? Did cutbacks so affect this critical function that the analysts were unable to perform basic audits of the funds? What Stevenson didn't mention was the work climate as a result of the layoffs: long term employees who are afraid they, too, will lose their jobs if they complain or speak out. Danny Wooten was not an island within the Engineering Division of the Public Works Departments. He, himself, supervised a clerical person, his assignments and work product were overseen by a manager, a fully licensed civil engineer; that manager would have reported to the City Engineer, who in turn would have worked under Siobhan Foster, the Public Works Director. The wagons have been circled; women and children to the middle; sacrifices made and others identified just waiting for the next bloody chapter. You can be assured that it is siege mentality within the fabulous Beaux Arts edifice that is Pasadena City Hall. Who's next they ask one another? When will the other shoe drop? Where two or three gather Under the Dome, a conspiracy is suspected. Have they fired Beck yet? Of course they haven't. I have to go talk to the PIO. I am not sure what the message is now. One thing you can say about LA Fan. He's Wooten Tootin'. Great picture Tattler. Such a beautiful building, such a terrible failure inside it. It has been hollowed out by years of incompetence and corruption. George, Hasmick, Flo, and Patty? Y'better call Saul. Saul may be too ethical. I'd suggest Tom Hagen, but he's too smart. The Under the Dome Way: "Talk big, fire little." Pasadena City Hall and the Capitol Bldg of Texas look very similar. 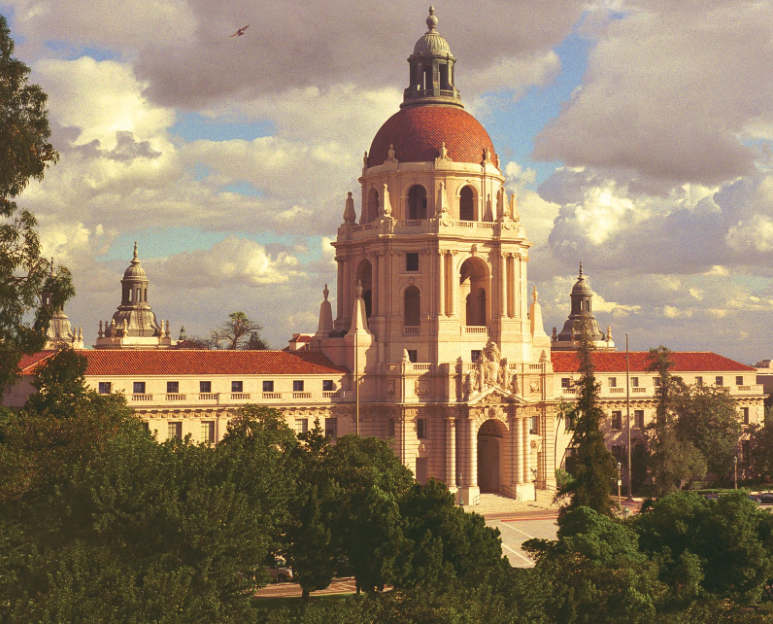 Pasadena City Hall is a star on the TV show Parks & Recreation. Put a statue of Queen Victoria in front of it and you would think you were in British Columbia. I don't follow the complexities of this scandal, but what I do know sickens me. Damn thieves. Corruption is always complex. Throw in a Mayor race and it gets exponentially worse. The part that gets me is how much of this is driven by politics. That is what 90% of this "process" Is about. It isn't the crime, it is the public's perception of its city government that they are concerned about. What we need to do is strip away that veil. What can you expect, Mr. Mod, when the Council and the Mayor are figureheads responsible for appearances at the Rose Parade, keeping a lid on the NFL and rock and roll venues in the Arroyo, and trying to keep the Convention Center afloat? $770 million a year to keep the City rolling down Colorado Blvd once a year is the price of entry. So what'sa loss of less than 1% and a few scandals along the way? The Sanctimonious Seven are there for the glory and the connections that pave the way for a brighter political career. Take a cue from Mayor Bogus and step down when the going gets tough. He'll end his reign on a bright note with a few hiccups along the way but overall it's been a great run. Kind of like Pasadena. Big on appearance, sadly lacking in substance. So what kind of example is set when Mercy Santoro abused her CoP credit card to wine and dine but the the whistle blower Jean Luter is the one terminated? Public sector employees are precluded from the perks the private sector enjoy for a good reason. Did her previous relationship with Beck get her special privileges? Beck is Bogaard's fixer. Don't expect any justice. PSN reports that Nick Conway's old job at the SGVCOG is looking for a grifter. Frontrunner for Interim Grifter previously held that same tenuous position and is the husband of a member city Mayor. His suits are not the bespoks gems of Italian wool worn by Nicky, but then it only pays a paltry $200,000. And on another PSN note, Adam Shiff is reportedly exploring a run for Barbara Boxer's soon to be vacated Senate seat. See? Just hang in there long enough and you, too, can be a player Terry Torneck! Schiffty has nothing on old Terry. If people paid attention and voted none of this would be happening. You get the government you deserve. Apparently elected officials in Pasadena are there for decorative purposes only. QUESTIONS #10-26: What did these seventeen (17) City employees know and when did they know it? Hmmmm ... eight down, nine to go. So many employees, so little time. The voters need to do some firing, too. I found it very interesting that the City Manager and the City Council and the Mayor all were given the report about the embezzlement in October. But, the problem was not announced until December. Seems like they wanted to keep it quiet for awhile until the deadline to file to run for election to the offices of Mayor and City Council passed???? Only the insiders knew about the problem and they could file to run for office and would not be challenged by others who might have come forward after the announcement. The timing of the announcement to the public was interesting as well. Right before New Year's Eve and the Rose Parade. Obviously we are seeing the results of a carefully planned public relations strategy. How dare they sit on it for so long. I think there are more embezzlement revelations to come. The reason the elected treasures of Pasadena are holding on to Becky is they are scared to death and need to keep a lid on this until after the election. They all need to be thrown out of office. There is no indication or hint that Elaine Aguilar does not follow the will of our citizens, nor is there anything that leads one to believe that there is corruption in our city government. Since MaryAnn was on the Council and insisted on regular yearly budgets, the city has been clean. The have even won awards from Sacramento for their financial status. To hint or accuse otherwise is a great disservice to the staff. You're kidding? Been to Camillo Road lately? All they care about at City Hall is money for pensions and benefits. Government in California is parasitic. City Hall is no exception. How many times have serious allegations been made against a City Manager and just allowed to evaporate ? In addition to ridiculing Pasadena for their corruption, we should take action in Sierra Madre. Ann Erdman: The city attorney also holds the title of city prosecutor. She is the lead in that office and there are several attorneys in the office who handle day-to-day issues, from contracts to litigation to prosecutions. Michele Bagneris does not represent the city manager and does not work for him. She reports to and advises the Pasadena City Council. Eric Maundry: How do you explain the lack of accountability on the part of Pasadena's elected officials? How many people will need to be fired before they think they're safe? Want to investigate a fiasco? Look into the history of the skating rink debacle. Millions down the rat hole in a speculative venture in NE Pasadena on a site too narrow that was ultimately found to be inappropriate. Millions! An unlicensed architect masquerading as City Architect sponsored by Cynthia Kurtz spreading largesse throughout greater Pasadena until he was ultimately dumped. The skating rink now resides in a tent on the Convention Center site. By the way, his wife was Joyce Streator's field rep. Talk about a conflict of interest. Ha Ha, I have a book titled "Whenever two or three are gathered together, someone spills his milk". Looks like the government of Pasadena has a lot of spilled milk going into the new year. Actually, why is nobody calling for an investigation into how it was John Kennedy's campaign consultant ended up with the $300,000 "outreach" contract for improvements at 1 park--Robinson Park. Remember the contract was recommended to be awarded to another firm when Kennedy stopped the process under the guise of community involvement and all of a sudden: Whamo! Out of nowhere, his consultant and campaign consultants get the contract. Later on Kennedy claims he had no idea. This is notwithstanding his consultant was present when Kennedy voted on the contract.....how is that for a smelly rat!! Investigate D.A.!! He does have Michelle Obama on speed dial. He can ask her. You need some fact checking here. You have at least 2 of the 4 employees on administrative leave incorrect. Larry Hammond (Purchasing Administrator) and Bonnie Hopkins (the engineer who was Wooten's direct supervisor) are 2 of the 4 currently on leave. Please look at the "Special Handling Request Form" I just posted towards the bottom of the article. 9:43 pm, you just checked my facts! Thank you for your post. Hey, Tattloid! Honestly now, is that all it takes to embezzle $6.4 from The Crown City? A 1/2 sheet form made on a copier with illegible signatures? Ms. Stevenson actually DID tell the Council what happens when whistleblowers speak up. "Ironically, the same day that the FBI set up their command post in Pasadena and the Department of Homeland Security worked with Pasadena’s TART team to secure the city for New Year’s events, Mr. Beck sent a letter to City employees in which he borrowed a law enforcement phrase. “If you see something, say something,” he encouraged them. Let me tell you, from personal experience, what happens when you do just that." She then proceeded to list the whistleblowers who were laid off . . . Susie Sulzbach, George Owens, Jean Luter, and herself (to name just a few). As a current City of Pasadena employee, let me tell you, WE got the message loud and clear. If you speak up, you'll lose your job. Unfortunately that climate of fear continues to this day. The best we can do is contact Ms. Stevenson, our former colleague, and encourage her to keep speaking out on our behalf. She is a Pasadena resident, and I'd be surprised if she can drive across town without getting flagged down by City of Pasadena employees thanking her and telling her to KEEP TALKING! I just want to let you know you have friends who support you. You are always welcome on the Tattler. Ms. Stevenson is a fine person and what happened to her, Susie Sulzbach, George Owens, Jean Luter and others should be viewed as a crime. Sheri Stevenson mentions in the video that she has a printout with her full remarks -- is this available anywhere online? Ironically, the same day that the FBI set up their command post in Pasadena and the Department of Homeland Security worked with Pasadena’s TART team to secure the city for New Year’s events, Mr. Beck sent a letter to City employees in which he borrowed a law enforcement phrase. “If you see something, say something,” he encouraged them. Let me tell you, from personal experience, what happens when you do just that. In 2011, Mr. Beck laid off Susie Sulzbach, an honest PMA President, Management Analyst, and outspoken Budget Watchdog. In 2011, Mr. Beck also laid off George Owens, Pasadena’s own Internal Auditor. Mr. Owens was a well-respected, older (over 50) African-American employee who saved the City of Pasadena more than enough money each year to cover his own salary (including benefits and burden) plus significantly more. CM Beck apparently did not appreciate the close scrutiny and recommendations for checks and balances that Mr. Owens professionally provided to all departments, including the City Manager's own office. In the City's closing brief regarding the 2011 arbitration requested by PMA (page 11), it states the following, "Grievant Owens was an internal auditor who was assigned audits directly by Mr. Green and reported directly to Mr. Green. In evaluating the impact on the Finance Department, Mr. Green determined that Grievant Owens’ loss would have a minimum impact on the Finance Department as Grievant Owens was in a single-purpose position. Grievant Owens duties could, when necessary, be conducted by an outside auditor or those audits would be conducted by Mr. Green or one of Mr. Green's immediate subordinates." Apparently Mr. Andrew Green, Finance Director, did not, in fact, conduct any audits personally, especially in the Finance Department, and he felt that singling out the City's auditor would have "minimum impact." $6.4 million in losses seems to prove that Mr. Green's actions were short-sighted at best and demonstrate fiduciary irresponsibility at worst. In 2012, Mr. Beck laid off Jean Luter, a Management Analyst in the Finance Department and, similar to those in 2011, an outspoken Budget Watchdog. Ms. Luter, another well-respected, older (over 50) African-American employee, had amongst her duties the oversight of all City purchasing cards (credit cards). Immediately prior to being laid off, Ms. Luter had recommended that a couple of the department heads be sanctioned for improper use of City purchasing cards. She recommended that certain restrictions be put in place with impartial oversight by the Finance Department. Less than one month later, Ms. Luter was laid off, and the department heads were made responsible for monitoring and approving their own purchasing card expenditures. In 2012, I was also laid off. I was Vice-President of PMA, a Management Analyst, and an outspoken Budget Watchdog in the Public Works Department. In fact, Mr. Beck publicly labeled me Pasadena’s “Resident Contrarian” because it irked him when I questioned inaccuracies in the budget. I could go on, but my three minutes will be up shortly. A common theme here is that there are many, many City employees who were and are honest, ethical, long-term City employees. We took pride in our work and weren’t afraid to speak up and question, challenge, and verify. Laying us off was an “in your face” message to the rest of the City employee population that it is, in fact, very dangerous to follow the mantra of “If you see something, say something.” Laying us off contributed to a culture of fear for those employees who would speak the truth. And believe me, there’s a lot more that could be said. If Pasadena’s H.R. Department had given it any thought, they would have been wise to do exit interviews with laid off employees, as they would have nothing to lose at that point to discuss the many, many additional things each of us knows and could share with a listening ear. Instead, City employees still working quickly learned to keep their mouths shut. I would ask you, if it’s not about Mr. Beck, if it’s not about the City Manager who leads our fine City, then who is it about? Thank you. Welcome! We've got some ground rules - no bashing of family, substitute asterisks and ampersands for expletives, and as a suggestion, vet your sources. Again, Welcome! We're anxious to help in the cause. Michael Beck. Still bashing the workers at City Hall to please his masters. Fire Michael, but also fire those whose feet he kisses. But we know that was why he was brought in. In spite of the Christmas presents and the movie tickets, he's not a nice person and his executive compensation perks depend on his ability to speak from both sides of his mouth. When you are ready to write a post about the Pasadena Public Health Department (PPHD), give me a ring. Eric Walsh is another name that you should get familiar with. Not only is he a homophobe and a religious nut, but he is essentially the main person who destroyed PPHD.